I just started out with Sigmoid neurons and i was reading a book and i didn’t understand multiple of the expressions they used in it like, “z ≡ w ⋅ x + b z ≡ w ⋅ x + b is a large positive number. Then e−z≈0e−z≈0 and so σ(z)≈1σ(z)≈1. In other words, when z=w⋅x+bz=w⋅x+b is large and positive, the output from the sigmoid neuron is approximately 1” most of this stuff like the squiggly equals and others i just don’t understand. If you have any tips pls help. 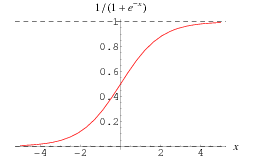 If you look on the x axis you will see that the sigmoid function is already close to 1 for x = 4, so if x is a large positive number it will be even closer to 1.